SAN DIEGO — Since the Padres entered the National League as an expansion team in 1969, their neighbors to the north have regularly used San Diego as a stepping stone to success in the National League West. Overall, the Dodgers have a one-sided, 457-391-1 edge in the “rivalry,” including Monday night’s 8-2 victory in the opener of a four-game series at Petco Park. 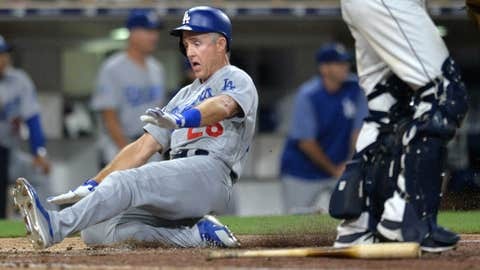 Last season, the Dodgers were 13-6 against the Padres en route to a 104-58 record and the National League West title. Tuesday night’s game will feature a match of left-handers — the Dodgers going with veteran Rich Hill (2-3, 4.56 earned run average) against Padres rookie Eric Lauer (4-5, 4.84 ERA). While Hill has a longer history of strong starts against the Padres, Lauer’s best start as a Padre came against the Dodgers in his third major league outing on May 6 in Monterrey, Mexico. Lauer shut out the Dodgers on seven hits and a walk over six innings to pick up his first major league win in the Padres’ 3-0 victory. After posting a 7.67 ERA in April and May, Lauer has posted a 2.76 ERA in seven starts since the start of June. The 4.91 drop in ERA is the best improvement among all major league pitchers with at least 25 innings. Over his last seven starts, the 23-year-old Lauer — the 25th overall pick in the 2016 draft, has gone 3-2 while allowing 15 runs (11 earned) on 43 hits and 14 walks with 28 strikeouts in 37 2/3 innings. Hill has known about conviction for some time now — particularly against the Padres. Tuesday night will be Hill’s ninth career start against the Padres. Over the first eight, he has gone 4-3 with a 3.18 ERA while limiting Padres hitters to a .184 opponents’ batting average. Over 45 1/3 innings against the Padres, Hill has averaged 11.12 strikeouts per nine innings while posting a 1.06 WHIP.